A USB audio interface lets you convert your analog audio signals (i.e. your voice) into a digital signal for your computer. They can vary in quality, features, inputs & outputs, and more. They all have mic preamps built into the XLR inputs, and at least one output for monitoring speakers or headphones. Compared to a built-in sound card, you’ll almost always get higher sound quality when using an external audio interface (essentially an external sound card) as well. If you want to simplify it, you’re converting XLR to USB (in the case of a microphone). The “best” USB audio interface will really depend on your needs and potential uses, so we’ll highlight brands and models with a range of I/O (input/output). We’ll start with the smaller units and move down the page toward the larger ones. It’s organized by the number of XLR mic inputs. All of the interfaces should work with both Mac OS and Windows, but I’ll mention if that’s not the case or if there have been any issues. Most are USB 2.0 but there are a couple that use USB 3.0. 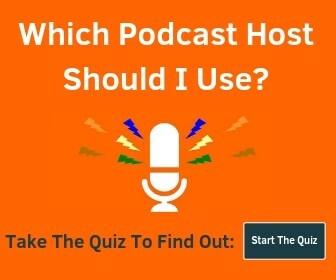 For podcasting and solo recording for most people, I would recommend starting in the ‘2×2’ section. If you have MIDI equipment that doesn’t connect over USB, look just below that in the ‘2×2 with MIDI’ section. If you want to record a band or several people at once, jump down to the ‘8+ Input’ section, although you may want to look at the best mixers as well. Looking for a mic to pair with one of these? Check out the best XLR microphones. Technically, these are 2-input USB interfaces, but they have 1 XLR input so we’re putting them in one category. The build quality by Focusrite is always great. The Scarlett Solo (2nd Gen) only has 1 XLR input with phantom power, but it also has a separate switchable line/instrument input. There’s a headphone jack and R/L RCA output as well. Similar to the Scarlett Solo above, the Steinberg UR12 USB interface has 1 XLR input with phantom power and 1 instrument input (but it’s not switchable to line level). 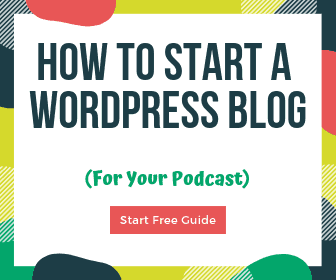 It’s made to be used on a laptop, desktop, or iPad with ease. 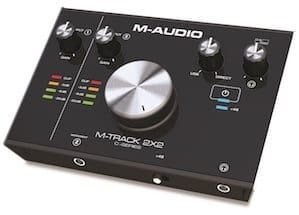 The M-Audio M-Track 2×2 gives you a nice clear view of your levels with -20dB, -6dB, and -3dB indicator lights for both the mic input and the instrument input. There is mix control, phantom power, and they include both USB 2.0 and USB-C cables for connection with newer computers. The Focusrite Scarlett 2i2 (2nd Gen) has 2 XLR inputs with gain control, 48V power, direct monitoring, and a headphone jack with gain, all powered over USB 2.0. The sample rates go all the way up to 192kHz / 24bit. This is one of the most popular USB audio interfaces for podcasters and guitarists looking to do solo or 2-person recording. The clean signal, updated drivers, and solid build quality that is made to last make this one of the top choices. The Mackie Onyx Blackjack 2×2 has somewhat of a unique form factor compared with many of the other USB interfaces. It’s propped up at an angle for easy use of the controls and all the cable inputs are on the back, giving it a nice and clean feel even when everything is plugged in. All the usual features are here as well: gain control, phantom power, headphone jack, zero-latency monitoring, and more. You can even monitor in mono or stereo. This is an excellent and well-thought out package for under $100. Behringer is usually known for their more budget-oriented (i.e. lower quality) products, but this audio interface is the real deal. It is priced at the budget end (about $60), but it has a full range of features, great mic preamps with 48V phantom power (switchable on the back), and is compatible with Mac OS and Windows. Univeral Audio offers SOLO, DUO, or QUAD models, which refers to single, dual, or quad-core processors. 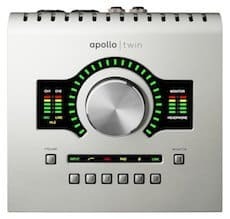 The UA Apollo Twin is a USB 3.0 Super Speed audio interface. These little guys are pricey but world-class, so you get what you pay for. Most of their other audio interfaces use Thunderbolt, but this article is just focused on USB connections, so maybe we’ll get into more detail in another post. For some reason, I don’t see the Zoom UAC-2 mentioned often, but it is the only (best) USB 3.0 audio interface at an affordable price. Class compliant mode can be turned on or off, monitoring can be done in mono or stereo, it can be powered by USB or 5V plug, has phantom power, Hi-Z (guitar) compatibility, and more. This thing is awesome. Plus, it looks really cool. The Tascam US-2×2 is another great option at a decent price. The industrial design is angled slightly upward for easy viewability of the controls, there is mic, line, and instrument settings, mix control, separate headphone control, and phantom power. Wirecutter even gave this USB interface their top pick recently. The Steinberg UR22KMII is designed with mobile recording in mind. It has 2 options to power and connect: USB 2.0 and 5v DC for iPads. It has MIDI I/O, phantom power, a headphone jack and mix control. Channel 2 has the option for Hi-Z electric guitar or bass direct connections as well. Like the UR12, the phantom power switch is on the back, which I don’t see being a big deal, but it could be for some. One of the best parts about getting a PreSonus recording interface is that they include Studio One 3 Artist recording software for free. It normally sells for $99, making this an amazing deal. AudioBox is their more entry-level interface series, but that doesn’t mean it’s not perfectly capable. Look for the Studio 26 in the section below if you want an upgraded model. The 96 in the name is important because they raised the maximum sample rate from 48kHz to 96kHz, but the price stayed the same. The new version just came out in May of 2017 and the bad reviews you see are just from people complaining that it didn’t come with a physical driver disk (which is silly because those are always out of date anyway). The PreSonus AudioBox USB 96 has 2 combo mic/instrument jacks with switchable 48V phantom power, up to 35dB gain, has mixer control to blend input with your computer, and has MIDI in and out. It is powered over USB so you can easily take it on the road. This is a solid option for $100. This is similar to the model in the solo section, but the ‘M’ model has an extra mic input and MIDI. Otherwise, the M-Audio M-Track 2X2M is the same, including large volume control, Cubase LE, 24-bit/192kHz resolution, and more. Compared to the 2i2, the Scarlett 2i4 adds MIDI I/O, additional balanced and unbalanced outputs, and a pad button for the inputs. There’s also the Focusrite Scarlett 6i6 that also has 2 XLR inputs with mic preamps, but gives you additional I/O as well. Like I mentioned above, all PreSonus interfaces come with Studio One 3 Artist DAW for free ($100 value). The PreSonus STUDIO 26 is a higher end USB interface. It has 2 XLR/combo jack inputs, 2 balanced 1/4″ TRS line outputs, 2 balanced 1/4″ TRS main outputs, MIDI I/O, and a headphone output. As you can see, there is a clear input and output display for your levels and even an A/B cue. This is one of my favorite smaller recording interfaces. We get some additional features with the Steinberg UR242 when compared with the UR22. The 48V switch has moved to the front, there is a PAD button for inputs 1 and 2, and there are two additional line inputs. So it’s actually 4 in / 2 out. Lastly, there is an onboard DSP. From the front, the Behringer U-Phoria UMC204HD looks just like the UMC202HD. You just get a couple extra outputs for an extra $20. Still a great value. Many people say this performs as good, or even better than interfaces twice as much. The Native Instruments Komplete Audio 6 is technically a 4 input audio interface, it has 2 XLR inputs and 2 balanced line inputs. There’s a large volume control dial on the top, and it has all the usual features including separate headphone monitoring, line/instrument switching, MIDI, etc. It also has S/PDIF I/O so you have plenty of options for connectivity. Avid’s Mbox 4×4 has 2 XLR inputs but has separate instrument line inputs as well as MIDI and S/PDIF I/O. This is a high-end USB interface with a price that matches. The PreSonus STUDIO 68 is a high-quality USB audio interface that will record sample rates up to 192kHz. 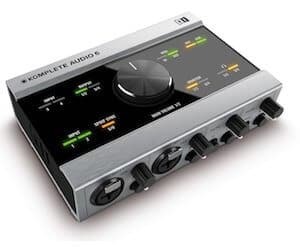 There are 4 XLR combo inputs (the 2 front inputs are mic/line/instrument, the 2 rear inputs are mic/line), 2 balanced 1/4″ line level outputs, 2 balanced 1/4″ outputs, headphone jack, and a MIDI – S/PDIF connection. There is also a power switch which unfortunately not every device has. PreSonus includes Studio One Artist DAW and the Studio Magic plug-in bundle, making this a great value. Here’s another solid 4 channel interface in the Tascam US-4×4. It’s built like the 2×2 with a slight upward orientation and rock-solid build quality. Preamps are excellent and drivers appear to work with everything. There are 2 headphone outputs with separate volume control, a main out, 4 line outs, 2 line ins, a switchable class compliant mode, power button, MIDI, and onboard DSP plug-ins. This 4-channel interface by Steinberg really has everything. Focusrite is well-known for their audio interfaces and the Scarlett 18i20 is no exception. There are two headphone outputs with individual gain control, 8 TRS/Mic inputs (2 on the front), MIDI I/O, S/PDIF I/O, Optical ADAT I/O, World Clock, and 10 1/4″ balanced outputs. 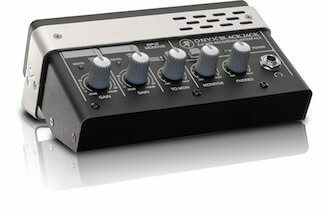 Phantom power can be switched on and off in two separate groups (channels 1-4 and 5-8) and the 2 front-panel inputs can also be used for instruments along with a -10dB pad for hot guitars. There are two headphone outputs with individual gain control, 8 TRS/Mic inputs (2 on the front), MIDI I/O, S/PDIF I/O, Optical ADAT I/O, World Clock, and 10 1/4″ balanced outputs. Phantom power can be switched on and off in two separate groups (channels 1-4 and 5-8) and the 2 front-panel inputs can also be used for instruments along with a -10dB pad for hot guitars. This all fits in a standard 1U rack mount enclosure. There is a companion Focusrite iOS Control app that lets you configure routing and cue mixes as well. This is nice studio hub that offers a lot at a reasonable price. The PreSonus AudioBox1818 VSL comes with 2 mic/instrument combo jacks and 6 mic/line combo jacks. 48V phantom power is delivered in 2 groups (1-4, 5-8), MIDI I/O, S/PDIF I/O, ADAT I/O, World Clock, and 10 balanced TRS line outputs (2 main, 8 additional). It includes one headphone jack, but if you need additional headphone outputs, the 1/3U rack-mountable PreSonus HP4 4-Channel Headphone Amplifier will not only match the look of the AudioBox1818, but it delivers excellent source-level audio quality – and it gets loud! The Tascam US-16X08 would probably be considered a budget model at around $300, but that doesn’t mean this interface won’t deliver. There are 8 XLR inputs and 8 line inputs (with line 9 and 10 being front-panel instrument inputs if you desire) that will all be delivered individually through USB to your DAW for a total of 16 tracks. There’s one headphone jack, phantom power in 2 groups (1-4 and 5-8), and MIDI I/O as well. It is rack mountable as well. The gain control knobs bunched together can make them a little hard to operate, but for the price, it’s not a major issue. The Behringer U-Phoria UMC1820 might not be the prettiest interface, but you get tons of control. Function > form in this case.Each input is a mic/line/instrument combo jack with dedicated pad and gain and there are 2 headphone outputs with separate gain control. You get MIDI I/O, S/PDIF I/O, and ADAT I/O – but no world clock connection. Each input is a mic/line/instrument combo jack with dedicated pad and gain and there are 2 headphone outputs with separate gain control. You get MIDI I/O, S/PDIF I/O, and ADAT I/O – but no world clock connection. 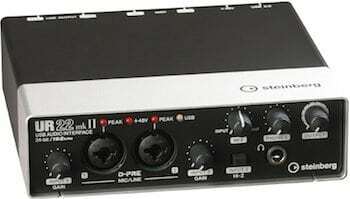 This is a still an excellent value at around $300 and for that price, I would choose this one over the Tascam. What really sets the MOTU 8pre USB apart from the others is both the quality of the preamps and the fact that you can individually control phantom power, 20dB pad, and trim. That means you can mix and match condenser and dynamic microphones, instruments, and other line inputs with ease. You can use it as a stand-alone USB interface or solely as a mic preamp. There is no channel sharing – the inputs, optical I/O, headphone out and main outs are all handled as separate channels.